Rogan josh is an aromatic curry dish hailing from Kashmir and is quite popular in India, Pakistan, Singapore and United Kingdom. Rogan (روغن) means oil in Persian, while josh (جوش) means heat, hot, boiling, or passionate. Rogan josh thus means cooked in oil at intense heat. 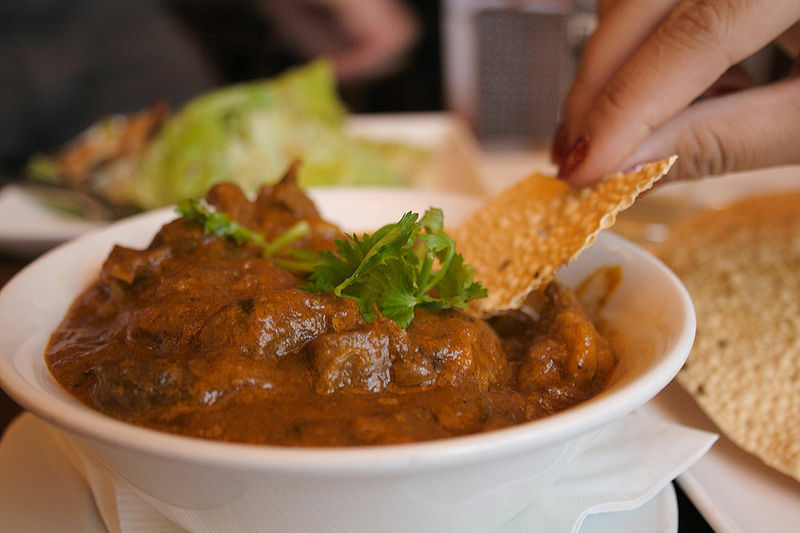 Rogan josh was brought to India by the Mughals. The unrelenting heat of the Indian plains took the Mughals frequently to Kashmir, which is where the first Indian adoption of Rogan josh occurred. Recipes vary widely across different regions and traditions, even within the region of Kashmir itself, but all include lamb or chicken, oil or ghee (clarified butter), and a mixture of spices. These may include paprika for its red color, aniseed, cloves, cumin, cinnamon, and many others. Many modern variations have ginger, garlic, and yogurt, and some also use tomatoes. Though the original versions use saffron instead of yogurt to make the sauce richer.